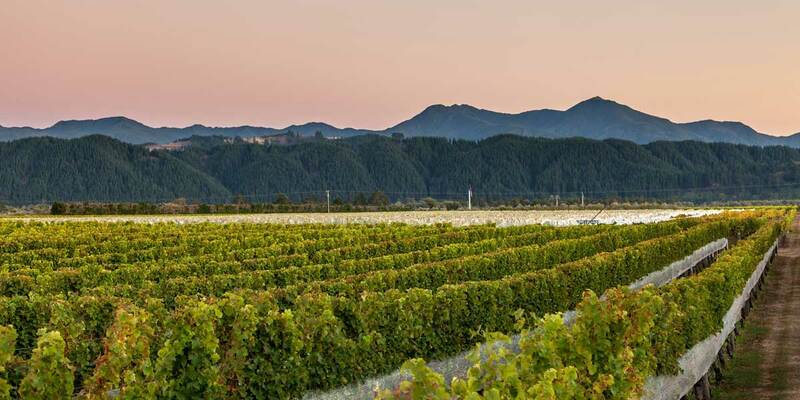 Far from the madding crowds, in the heart of Marlborough’s wine district, you will find Straw Lodge Vineyard, and our very different straw-bale constructed homestead and Vineyard Suites — a very special place where rest, relaxation and rejuvenation awaits the discerning traveller. 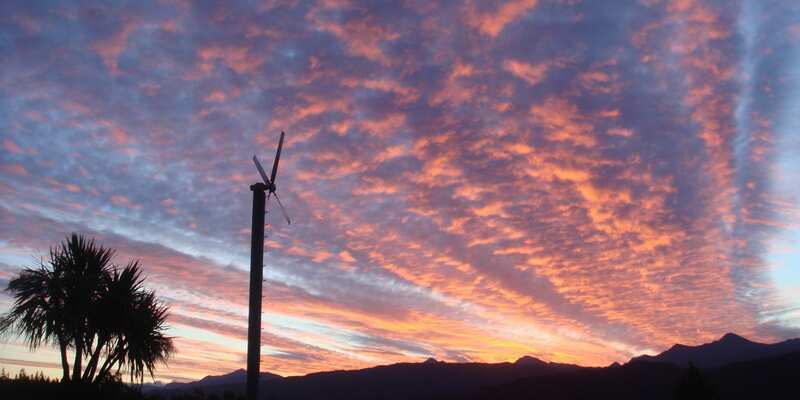 Visible from each suite are glorious mountain ranges, behind which the sun sets in beautiful displays of rich colours. Before you retire to your cosy king size bed, bathe in our warm spa pool at night, and gaze up at the clear skies filled with a galaxy of stars. Each private suite has a lounge and en-suite bathroom. Rise at your leisure to a treat of a continental and/or cooked breakfast, created from home grown or locally produced foods of your choice. 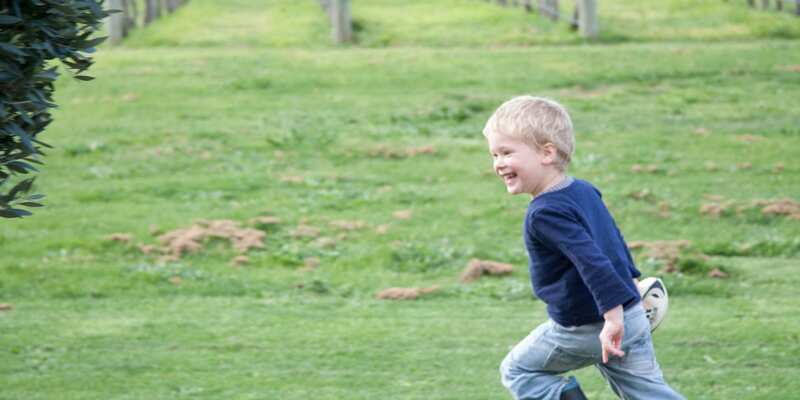 Then set out on our pedal bikes, take your own vehicle, or book a tour through the surrounding wineries. 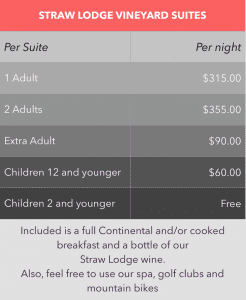 Internet use is free of charge, as are our golf clubs, DVDs, and a bottle of wine from our vineyard! The guest accommodation comprises Vineyard Suites 1 & 2 which are both North facing and have glorious mountain views. They are located in a separate wing to the main house, with the vineyard’s Sauvignon Blanc vines coming right to the door. Suite 1 has a King bed, and Suite 2 has a king/twin bed that can be converted into two single beds. Both Suites have a spacious lounge area with a double settee that can be converted into a comfortable double bed for extra guests. A portable cot is also available for both Suites. Each Suite is private, but can be inter connected by the adjoining courtyards. 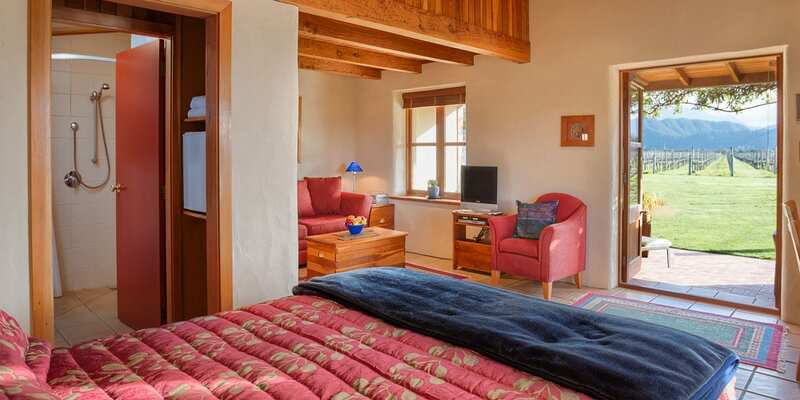 Our Vineyard suites are well equipped and have a spacious, open plan layout. There is a lounge area with a TV and DVD player. Each suite has an en-suite bathroom, tea/coffee making facilities, a refrigerator, a writing desk, a safe, a private entrance and courtyard areas. The courtyards of these two suites can be inter-connected. There is an additional BBQ courtyard adjoining the suites and another covered BBQ area connected to the main house. Guests are welcome to use either of these. Laundry facilities are available. Teas, coffee, fruit juice and toiletries are supplied, as is a complimentary bottle of our wine for you to enjoy during your stay! A private outdoor spa and laundry facilities are provided, as well as golf clubs, and 6 mountain bikes. Free wifi is also on offer. Trudy and Barry were wonderful hosts. We were made to feel like long lost friends . Straw lodge is a small organic winery and my husband asked if he could help with the netting of the grapes.We had use of some bikes and took a ride thru the vineyards. The breakfasts were great and we even used their barbecue to grill one night. The accommodations were some of the best we've had in our month long tour of the South Island . I highly recommend Straw Lodge! We were visiting Marlborough for the vineyards and wineries. 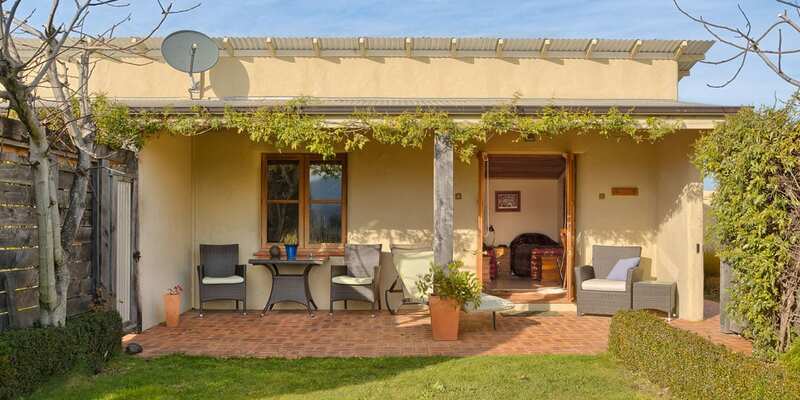 Straw Lodge is a small, intimate property located in the middle of a beautiful vineyard. Location is a close 5-10 minute drive to all major wineries. Our room was cozy yet efficiently designed. The host, Trudy, is wonderful and very charming. I can't say enough good things about the B and B ! The room was lovely, comfortable and convenient, and the hosts were friendly, helpful and efficient. 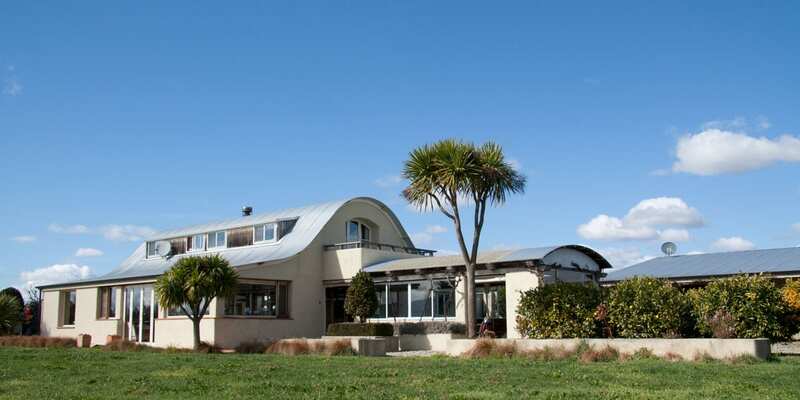 On a month long trip to New Zealand involving several B&Bs, breakfast at Straw Lodge won first prize. 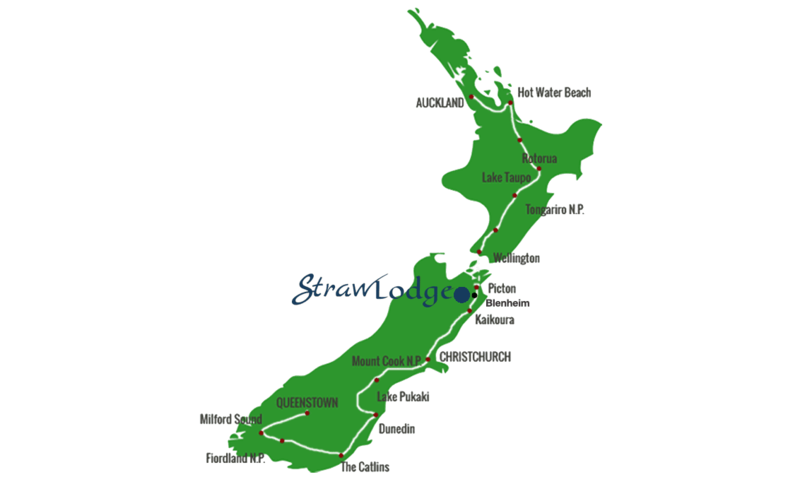 If I were ever lucky enough to return to New Zealand, I would go there again and for longer! What a place! Perfect cottage, tranquil, peaceful and idyllic. With the vines surrounding you, you feel encapsulated in your own viniculture paradise. We enjoyed a wonderful BBQ surrounded by fresh fruit and washed down with some of the local produce. Trudy and Barry were wonderful and welcoming- even when I flooded the tumble dryer. A must stay... Cannot recommend enough. With pleasure we’re looking back at our stay at the Straw Lodge. Great hospitality, unique lodge, very tasty breakfast and a stunning view, made it one of our best memories of our New Zealand holiday. We really recommend this accommodation, but stay at least 2 nights because 1 night is definitely too short. Some day we hope to come back again. My girlfriend and I stayed here when arriving to New Zealand. It was such a delight. Trudy and Barry were wonderful hosts to say the least. They greeted us with the most delicious fudge, a great sav. blanc, cherries and the cutest sign welcoming us. We had the most amazing stay at Straw lodge. The location is perfect a few minutes from the wineries, views from the room are spectacular and hospitality is amazing. Trudy and Barry went out of their way... Trudy baked us a love heart chocolate cake and poured us wine to celebrate. While providing an individualised experience they also respect privacy and space. Couldn't recommend the stay here more highly. Will be recommending this to family and friends for a long time to come. We had two nights at Straw Lodge after completing the Queen Charlotte Track. Trudy made us feel so welcome and had got in food for us to BBQ on our first evening as she guessed we would not want to go out to find a place to eat. On the second night she drove us to a local restaurant. 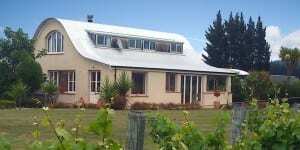 The lodge is set in a vineyard with stunning views, comfortable rooms and Trudy provided a wonderful breakfast. We would love to visit again! Trudy and Barry are the most hospitable hosts and the facilities are excellent. We stayed for 2 days and wished it was longer. They have very good organic Sauvignon blanc and Pinot noir wines which we sampled and ended up buying. Thoroughly enjoyed ourselves! Trudy and Barry are such tremendous hosts. It was like staying with family you enjoy, clean, great goodies and breakfast. They even gave great guidance for our local trips and next Australian journey! Thank you, thank you! By far the nicest place we stayed in New Zealand. Trudy and Barry were exceptional hosts in every way, and first rate cooks to boot. 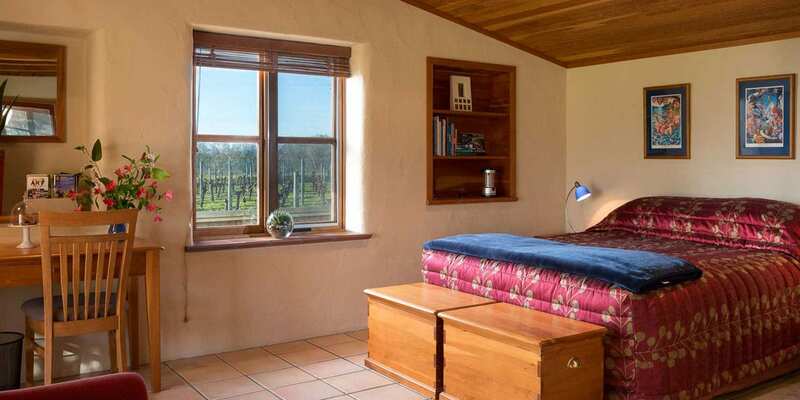 Straw lodge is a couple of big and super comfortable rooms on a working, organic vineyard in the heart of the Marlborough region. The vines are right outside the front door and you're free to wander around and ask lots of geeky questions about how the wine is made. It's all about the personal touch here. From the handwritten welcome blackboard to the cake Trudy baked to help us celebrate my girlfriend's 30th birthday, we felt incredibly looked after here. They even gave us a parting gift of some home-baked fudge! We stayed for just the one night which was definitely not long enough. The family were welcoming, the views and facilities fantastic and the wine and platter to due for. All in all a thoroughly recommended place not to miss! Our first visit to Straw Lodge seven years ago had been truly magical. Our return was equally as memorable! Our accommodation was even better than we remembered. Peaceful, quiet well-insulated rooms with simply astounding views down through the vineyards with the range of hills in the background. Trudy, Barry and family are the perfect hosts with Trudy especially always available when we needed help ... Breakfasts were a special treat with Trudy's home made jams and baking a feature. It is impossible not to relax in such a setting...Definitely coming back! Sadly we only had one night here, far to short a time! Beautiful accommodation with the most welcoming owners who catered for every need, and it really is the attention to detail that counts, and it shows. A very warm welcome with lovely goodies in the room. 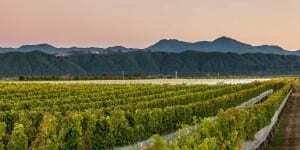 This little gem is perfectly situated for visiting the vineyards in Marlborough and a perfect relaxing base for a few days. The food was perfect, simply perfect as was the owners and their family. This would definitely be first choice when visiting Marlborough region again. We thoroughly everything about this property from the beautifully decorated room, outdoor patio and view overlooking the vineyard...The hosts, Trudy & Barry, went out of their way to make our stay fabulous and offered excellent recommendations for activities and tours in the area. Breakfast is absolutely delightful with anything you could wish for including home cooked hot breakfast and pastries...After our New Zealand trip was over we regretted that we didn't book a longer stay at the Straw Lodge... but we know it's the first place we'd return to on our next visit!